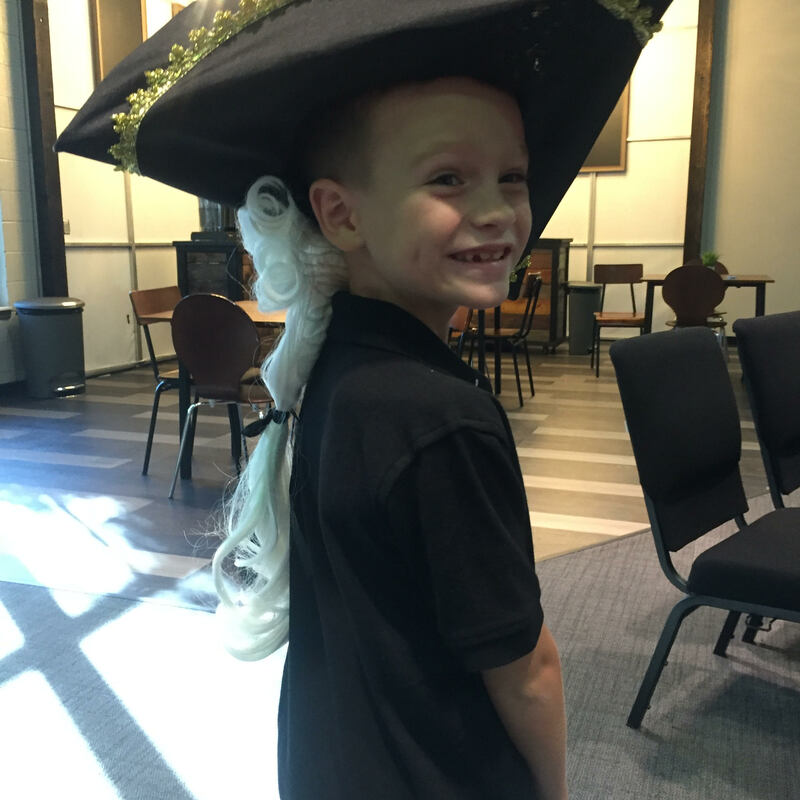 Look who got to play George Washington at school on Friday!! They did a little presentation for the parents at chapel and he had his first on-stage speaking part. l was so proud of him… This once incredibly shy, would-not-even-look-at-someone-he-didn’t-know boy spoke with poise and confidence and a smile. Watching your kiddos stretch and grow and step outside their comfort zones and develop character is such a rewarding thing as a parent! 2. 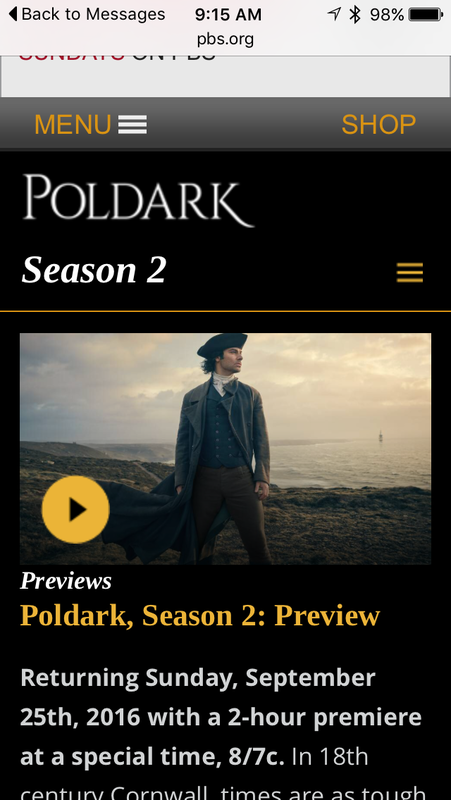 Poldark: Season 2 is Coming! Oh happy day!! Did you see that is coming?!?! I’m super picky about what shows I’ll watch. To me, a lot of TV is boring, lacking character depth and engaging storylines. So most of the time, when we try out a new show that has been raved about, I feel let down. But not Poldark!! From the first episode, we were hooked. It is 100% my kind of show. I love the rich character development and have high hopes for Season 2!! My phone showed a message from WhatsApp earlier this week — which can only mean one thing: Someone from South Africa was texting me. 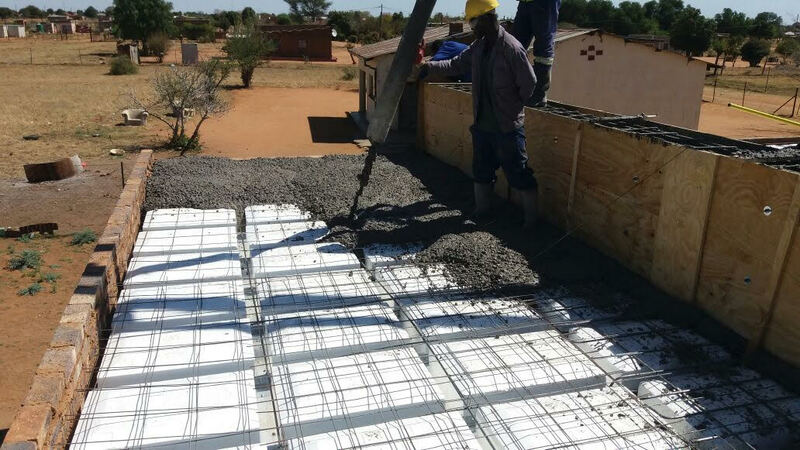 I was thrilled to get the text with these photos from the large building you all are helping to build at Reagaboka. After going last year and getting to see the classrooms you all helped build, I’m just ecstatic about this new building knowing what a need it is going to meet in so many ways in this community. Can you believe that they are putting a roof on it now?? It’s getting SO close to being done. And this could have never happened without you all. 4. We’re GOING to South Africa Next Week!!!!! You guys, I’m SO excited! And seeing the above pictures just makes me more excited. Those of you who are long-time followers know how part of my heart will always be in South Africa. And I’m absolutely thrilled that I get the opportunity to bring a team of my readers with me to South Africa. My mom has been so kind to be willing to come and stay with them and they are looking forward to getting to spend a lot of quality time with Grandma while we’re gone. If you want to follow along with our trip, be sure to (if you aren’t following me already). That’s likely where I’ll be updating the most. I may also post some on Snapchat (I’m crystal.paine there) or see if I can get good enough wifi to hop on Facebook Live. And I’ll be sure to post some details about our trip on my blog — either while we’re in South Africa or after we get back home. I was struggling and stressing over some situations in my life that are outside my control and I read a chapter in last week that kicked my behind. I realized my fear and anxiety was really just my lack of trusting in my all-wise, all-knowing, always-working-for-my-good Heavenly Father. I can leave my burdens, my stress, my anxiety at His feet and I can rest in the truth that He is in control. He doesn’t need me to try to fix, solve, or micro-manage all the details of my life and others’ lives. He calls me to rest in His Master Plan and trust His unfailing goodness. This truth brought so much peace at a deep level. He is good! And this truth sinking deep in my soul made this past week a thousand times better. Looking for more? Read more posts about 5 Things I'm Loving This Week. Thank you for the post! Good words to read as I am stressing about many things going on in my life too. Your words are always very encouraging. 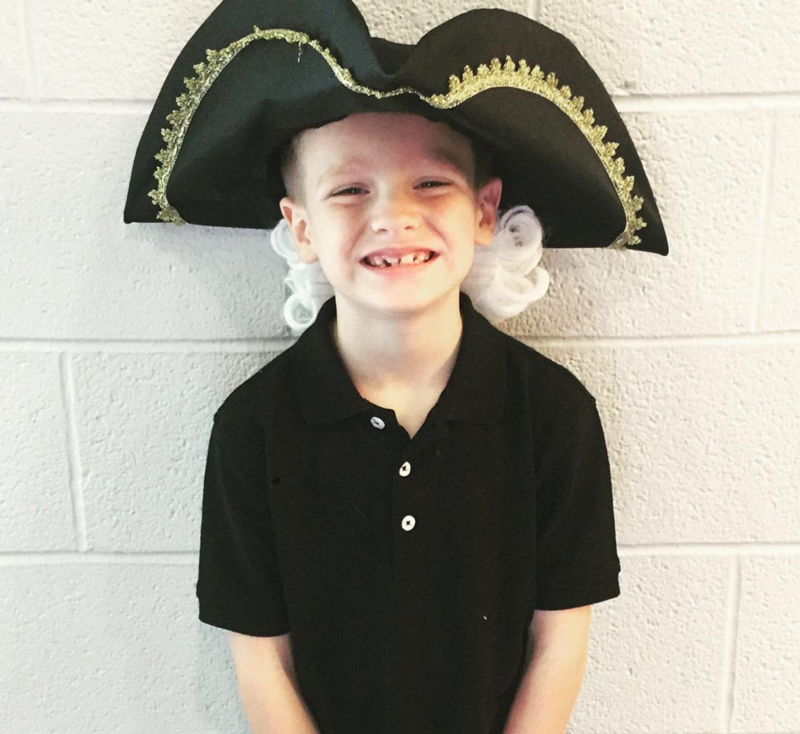 Your son is absolutely adorable as George Washington by the way! Love the posts! You are so welcome! I’m glad it encouraged you! I am loving the little successes in life my 3 boys have accomplished this week! I am loving your book, Say Goodbye to Survival Mode! I used one of my Audible credits to get the audiobook, and have listened to it during my daily commute (half hour both ways). Listening to you read it makes it seem like we’re having a friendly conversation, and without the audiobook, I probably never would have had the chance to read it. The suggestions you make in the book have challenged me to really examine several aspects of my life. It’s all still so new, fresh, and raw that I can’t quite adequately describe the affect it has had, but I will say that now I feel so much more relaxed, purposeful, and at peace with my crazy, hectic life. Thank you for using your gifts to share such an important message! Aw, I am SO grateful to hear this! Thank you so much for taking the time to share! I have a big problem, and I’m not sure if you addressed it in your years of blogging. You have a problem with doing too much….but I have a problem with being lazy. I don’t follow through with weekend plans with friends (I no show), I start something, or make a goal and just fizzle. I’ve tried accountability partners and I still fail. I totally blame myself, not others. I don’t think I’ve even completed a goal. I would love for you to address this as maybe there are others with this problem. I would love your input. Could you pick one tiny goal and stick with it for 30 days? Maybe starting really, really small could give you the little nudge you need to see that you CAN be successful and that might inspire you to try a little bit bigger things? Could be anemia or something like that. I felt like that for several years until routine blood work picked up on it. Within a week of iron pills I felt like a new woman. Or depression, maybe. Not wanting to go out with friends is suspicious. I’m super picky about TV too, so I’m going to check Netflix for Poldark episodes, thanks for the suggestion! 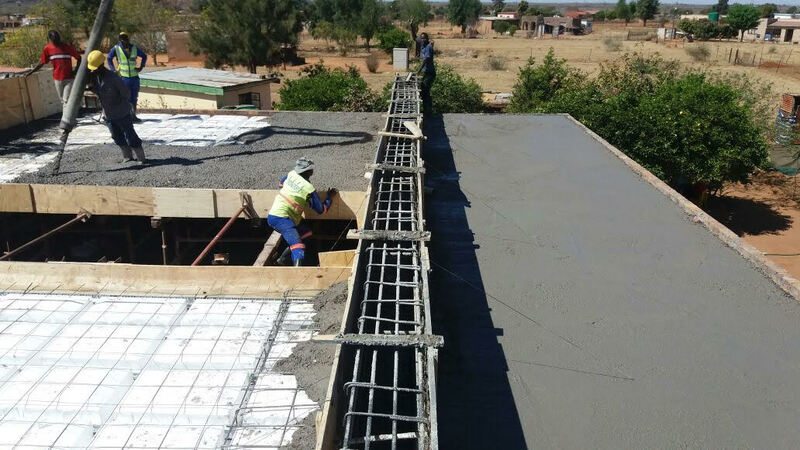 1) The 1st big work project out of 5 is almost finished! I love my job, but after completing project #5, I’ll be able to cut my hours even more to stay home with my girls 5-6 days a week! 2) Started our 8th year of homeschool on Monday and it’s going incredibly well. Last year was our toughest year ever so this peaceful first week has been such a welcome relief. 3) Good attitudes from everyone during a weekend trip with the husband’s family, lots of time to enjoy my new niece! 5) My Bible. It’s suddenly come alive for me & I just can’t get enough. It’s thrilling to me to see God answer my heart-cries for a love and hunger for His word. YAY for a peaceful first week of homeschool! That makes me so happy for you!! Oh, thank you for this reminder in #5. Things in my life the last couple of months feel so crazy and out of control, and I need to remember that. So often I let fear rule me and forget that I have a very big God who loves me so much and is caring for every detail. I am so thankful for you and your blog. Yes! Yes! Yes! I’m SO grateful that it encouraged you! Your little George Washington is adorable! I hope you and the readers going have a wonderful, impactful, thought provoking, relationship building trip to South Africa! I am looking forward to seeing/reading all about it! Whoa Your number 5! I had a very similar experience with truths about God this week also. A passage in scripture I had glossed over before suddenly stuck out to me and struck me straight in my heart concerning one of the hardest things I have grappled with concerning my faith. I came away from that time with a greater understanding of God’s soveriegnty (sp?) and His goodness and how I can really trust God in His soveriegnty because He is good. He IS good. I needed that belief to sink deep into my heart, because if I don’t believe that He is good I can’t fully trust Him. I hadn’t been really fully trusting Him for several years. That belief in His ultimate goodness was shaken for me by a very real very hard reality but wow it just really sunk in that I look at things completely different with my human perspective than God does from His sovereign, good to the core perspective. And it comes back to me not trying to figure God out, why did this happen etc etc. Bottom line for me trust Him, He is good. I have no real words to articulate what was “caught” by my heart in that moment but it was so so healing and made my week and will impact me from here on out so I wanted to try. I hope that made some type of sense! Have a wonderful upcoming week and trip! Jody, your comment is beautiful. It’s the comment I wish I could write right now. I’m going through something that’s the hardest thing I’ve gone through and I know God is good, but I want to be able to praise him and trust him in the way you articulated in your comment. Thank you for giving me more hope that God will bring us through those dark, soul crushing times. Wow, Jody! This coming from you — someone who I look up to so much for what you’ve been through in life — was just absolutely beautiful. Thank you for taking the time to share it. It encouraged me — and many others, too, I’m sure! I’m so grateful that it encouraged you! I know you love reading. What books do you plan on reading during your long flight to and from? (I’m sure you will be to busy when you are actually there.) Love your updates and praying for safe travel. Thanks so much for asking this! I’m going to post on Wednesday with the books I’m bringing for those who are curious! 1. Seeing my grandbaby learning to speak words (she’s 2) has been awesome. She christened me Mimi and that’s just as good, or better, than Nana. 2. I stood up for myself in one of the crazy situations in my life. 3. My daughter started college and is only missing 0.5 point from perfect scores. 4. I’m slowly getting back to reading. 5. I’m learning that my addiction doesn’t have to rule my life. Regina, as someone who is married to a recovering alcoholic I hope you can keep on going one day at a time and believe in yourself, that you can overcome this situation (s) and live your best life. You’ve listed many blessings above! Best wishes! Regina! I LOVE that you shared this — even in the midst of a very hard time in your life! And my heart goes out to you! I’d like to add that because we aren’t trusting our Heavenly Father enough when we live in fear and anxiety, it means we are believing lies. We can kick the lies to the curb when we find out what the fear and anxiety messages are be are believing, and then replace them with the Truth. To stop them quickly, when we are replacing the lies with Truth, repeat the Truth spoken out loud three times. It’s like speaking/preaching Gospel to ourselves as Ann Voskamp would put it. Such a good word! Thank you so much for sharing! Is Poldark appropriate for kids to watch? No. There is some adult content that is not appropriate for kids. There are premarital “romantic scenes” that are not appropriate for kids. The main character realizes his faults and failures and tries to do right but not a lesson that kids need to learn in my humble opinion. I agree. I’d say it’s definitely more of an adult show. It’s a little bit edge-y, but tastefully done (in my opinion), but not a show we’d let our kids watch at their ages. I think it’d rank between a PG and a PG-13 rating, if it were rated. I’m so grateful it encouraged you. What an exciting time for you!! Right now, I am loving the closeness that my husband and I are experiencing. For a time, we were under a lot of stress and tension; God is allowing us to be in a season where we have more time and space to be together – something I am loving and thankful for. May I add a slightly different perspective on #5? People who suffer from anxiety disorders or depression aren’t having these issues because they don’t trust God enough. There are chemical imbalances that occur in their brains and bodies. I struggle with anxiety and have for as long as I can remember. I’m also deeply in love with my Heavenly Father. For the most part I can absolutely lean on Him and His faithfulness. When a panic attack kicks in, my heart rate races, my breathing becomes more shallow, I start to lose sensation in my fingers and toes. No matter how much I try to think rationally, my brain and my body aren’t having it. Forty years of hearing people say if I “just had enough faith” I wouldn’t worry/have anxiety…I now have a peace that this isn’t an indicator of my faith OR God’s love for me. In all my years, I’ve never heard someone tell a person with infertility or diabetes or any number of other hormonal imbalances that they’re condition is because they’re not trusting God. We need to stop shaming people who suffer differently than we do. 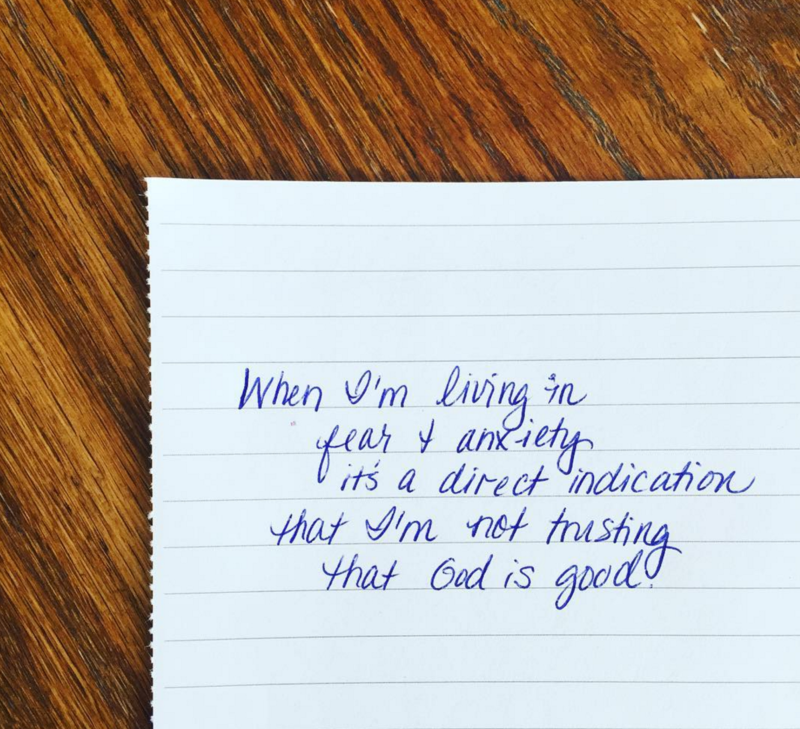 As longtime readers know, I have struggled with anxiety since I was a young child that is a physical issue, not a spiritual issue (see my post from a few months ago on this). That’s why I used the words “fear and anxiety” in what I wrote, because for me, when I’m living in fear that results in anxiety, it’s a lack of faith. Physical anxiety that has nothing to do with fear and faith is a completely different thing for me and I so wholeheartedly agree that sometimes medical or other treatment is necessary and important and telling someone to “just trust God more” is never the right answer in those cases. I think it’s key to figure out the root of where the anxiety is stemming from — whether it’s stress-triggered or fear-based or whether it’s a chemical imbalance or something entirely different. That’s the only way to really get to the root of it and be able to find solutions. Thanks so much for saying something so I could clarify what I was referring to here. Please know that the last thing I wanted to do in posting this was to shame someone! And I am so sorry if someone read the quote as me posting it as a blanket statement for everyone. I just wanted to share what I personally was learning and how it had impacted me so deeply. I played George Washington in elementary school. Still one of my favorite memories haha. Good luck in South Africa! My husband and I just watched the very first episode of Poldark, and we are already impressed! Thanks for the recommendation! On a more serious note, I really needed to hear your last point about trusting God, as our young adult sons are making important life direction/college decisions right now, and it is difficult as parents to know how much to be involved, esp. when they live at home, but are adults (or close to it). I find it easier to “let go and trust God” when I don’t feel any responsibility in a situation, but often we have to “do our part” first (esp. as parents), and that can feel stressful. It’s also hard when you cannot “control” the decisions of someone else, but in the end, trust is necessary and I have to let God be in control. So even though it doesn’t feel good, I’m “loving” learning to trust God in new areas of my life and receiving his peace. I’m also loving relishing each moment with my family, esp. when I realize that my years with our sons living at home is limited. And a little “mindless”, but wholesome TV as a nice distraction won’t hurt, either! Thanks for another thoughtful post. I’m so excited that you get to go back to South Africa! 1) That our first day of homeschool went super well! 2) The opportunity to take a nap this afternoon because I was super-tired. 3) The outdoor patio chairs that I got for my birthday-such a relaxing place to hang out. 4) Bike rides with my family. 5) The book “The 15 Invaluable Laws of Growth” by John C. Maxwell. I love the idea of 5 things you are loving. Thank you! 1) I have stuck to my morning routine each morning this week, which includes a good workout. 3) I found a space for my daughter at a pre-school for the time-slot that works best for our family. She starts today. 4) We are traveling to visit family this weekend. 5) I’m so grateful I work from home and don’t miss all those special moments with my little ones. Also, vacations. Gotta love that. 😉 And I’m going to check out Poldark!